All other things being equal, St. Patrick’s Day may be the most exciting time to visit Savannah, GA. The city goes all out, like New Orleans during Mardi Gras. If you have the means to be anywhere in the world on March 17, 2011, consider traveling to Savannah. St. Patrick’s Day stretches out for several days in Savannah; the best thing for visitors is to get comfortable in a Savannah Vacation Rental and take in as much or as little as you like. The annual St. Patrick’s Day Parade brings many men in kilts with bagpipes to the streets. Who knew there were so many bagpipe players in the United States? Watch the dazzling footwork of the Irish Dancers of Savannah and gaze upon green antique cars. In fact, just about everything that can be turned green is green on St. Patrick’s Day in Savannah, including the waters in the Forsyth Park fountain. 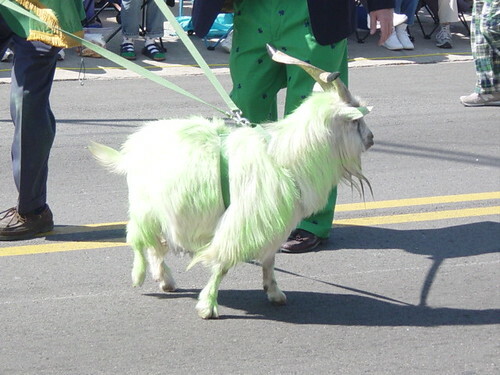 Even the goats are green on St. Patrick's Day in Savannah. Savannah has been celebrating St. Patrick’s Day in style since 1813. If you can’t make it this year, book one of our Savannah Vacation Homes for 2013 – the 200th anniversary of St. Patrick’s Day in Savannah should be unforgettable. Please see Savannah St. Patrick’s Day Parade for details about the event.